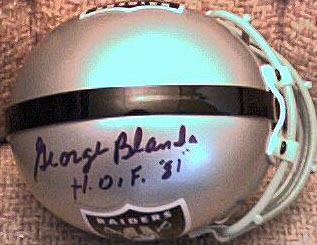 Oakland Raiders mini helmet autographed in black marker by the late, great kicker and quarterback George Blanda and inscribed with his Hall of Fame year. Obtained via private signing many years ago. With certificate of authenticity from AutographsForSale.com. ONLY ONE LEFT.